As part of our guide on US Visa Types, we offer related articles like this one, Entry into United States to help guide you on the next step after you receive the visa. With a visa in your passport you are well on your way to entry into United States. Indeed, your visa now enables you to seek admission, entry into United States. Upon entry CBP will certainly provide you with the classification allowed by the visa. Customs and Border Protection (CBP) staff the airports and border entry points at which international visitors to the United States arrive. These officers will examine your visa and ask appropriate questions if necessary. Assuming that you answer the questions well, the CBP officer will then admit you. Once in the the United States, you can download your I-94. Admission is a technical term. It means that the United States accepts that you are lawfully here. You therefore have certain protections. Sometimes people seeking entry to the United States run into trouble. CBP might refuse admission even though the visitor has a visa. CBP’s refusal often comes from hearing bad answers to questions. These answers from the applicant that are generally incompatible with the visa presented during admission. For example, perhaps you arrive on a tourist visa and a CBP officer asks you the purpose of your visit. You reply that your fiancé is a US citizen and that you are hoping to get married. The CBP officer will likely tell you that you are an intending immigrant. But, you are not in possession of an immigrant visa. In these circumstances, an applicant entry into United States might find that CBP cancels the applicant’s visa. If a person arrives on a flight, a lot of times CBP will require the airline to return the unsuccessful applicant for entry into United States back to the person’s home country. If the person arrives at a port of entry to the United States by car, coming from Canada or Mexico, CBP as a broader range of options. Sometimes CBP will allow a person to withdraw their request for admission without prejudice, meaning that the applicant can try again. In the worst-case scenario, CBP can remove the person from the United States by issuing them an expedited removal order. Applicants for admission that CBP removed due to the expedited process are subject to a five year ban on readmission to the United States. If you need to gain admission in less than five years, you can apply for an I-212 waiver of this ground of inadmissibility. In some circumstances, it is critical to the person arriving in the United States that they are successful in entry into United States. We can help through advising on the best way to present your case to CBP. 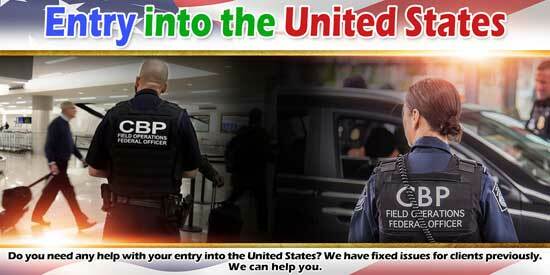 Some people have been denied entry into United States by CBP and need advice on their options. We can provide this advice. In some circumstances, it is possible to try again to gain entry to the United States. We can advise on the likelihood of success. If any of these scenarios fits you, and you would like our help, please contact us.